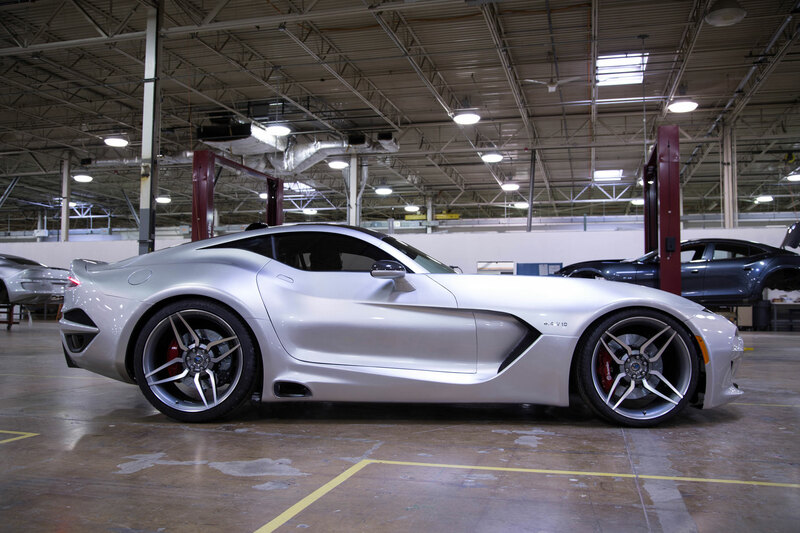 Michigan-based VLF Automotive produces some of the auto industry’s most stylish and powerful vehicles, delivering visceral thrills, tailored craftsmanship, and incorporating coach-built design that evokes the whimsy of a bygone era. In an age where it seems as though most premium sports car makers are chasing volume and, in some cases, imbuing their lineups with questionable styling, VLF’s trifecta of low production, raw power, and classic proportioning makes for spots cars with guts. We’d expect nothing less from Lutz. Car Guys: Giblert Villarreal (left), Bob Lutz (center), Henrik Fisker (right) stand beside a white Destino V8 at VLF Automotive’s headquarters. Headed by auto industry icon Bob Lutz, industrialist Gilbert Villarreal, and design extraordinaire Henrik Fisker, VLF produces three models that are collectively emblematic of what’s possible when car guys are at the helm with no bean counters in sight to dilute a vehicle’s essence. As Bob Lutz famously detailed in his book, Car Guys Vs. Bean Counters: The Battle for the Soul of American Business, the heavy hand of finance and accounting teams at automakers have led to vehicles being stripped of character, devoid of performance and lacking in quality, all in the name of making balance sheets look better. A promising concept would inevitably turn into what seemed to be a cheap and half-hearted knockoff by the time it landed on dealer lots. In the end, consumers caught on to the corners being cut and, in the case of General Motors, it had some dire consequences in the 2000’s. Lutz made a strong argument in his book and throughout his career for delivering excellence to the consumer in terms of design, performance and quality, so it’s no surprise under his stewardship that VLF’s delivers on those fronts in spades. A truly fascinating automotive amalgam that brings together unexpected elements, the Destino V8 is based off of designer Henrick Fisker’s blueprint for the 4-door Fiscker Karama, which was one of the first luxury plug-in hybrid electric vehicles to market. The design has been updated to good effect with a rectangular grille and more conventional styling cues incorporated into the front fascia. The look is sleek, modern and highly appealing, somewhat resembling a more elegant interpretation of the Jaguar F-Type from certain perspectives. Under the hood, the Karma’s hybrid powertrain has been replaced with a Corvette LS9 V8 engine that is good for 604-hp and capable of propelling the Detino V8 0-60 mph in 3.9 seconds, thanks in large part to the lightweight aluminum body and aluminum space frame. It’s all quite impressive, especially considering the generous accommodations for four within the beautifully outfitted cabin, replete with carbon fiber trim and supple leather. Atop the brand’s lineup is the Force 1 V10, which fuses together lightweight carbon fiber construction with a 8.4 liter V10 engine that produces 745-hp, making it “one of the most powerful naturally aspirated road engines in the world,” according to VLF. Being devoid of superchargers, turbochargers, or hybrid assists allows for good, old-fashioned linear power delivery and a more natural driving experience. The cabin features leather, suede, Alcantarra and, naturally, a champagne holder. The purposeful exterior design is punctuated by functional elements that assist with performance. Intakes and outlets provide cooling for the mechanics, while spoilers and a rear diffuser provide downforce and assist with improving aerodynamics. Fisker designed Force 1 V10 in the classic American sports car idiom with a long hood, short front overhang, long tail and pushed out wheels. A standout styling element is the side rear windows, which flows with elegance and, well, force into the the C-pillar. From there the eye is drawn to the rear which has a wing-style spoiler atop the glass area that doubles as a wifi antenna. Further down are what VLF says are the world’s thinnest taillamps, cleanly integrated below the decklid. From any angle, the Force 1 V10 is a striking work of art. Developed in collaboration with Galpin Auto Sports, the VLF Rocket V8 begins with the bones of the Ford Mustang and undergoes major updates as the metal body panels are replaced with sculpted carbon fiber ones that allow for a larger grille, functional front splitter, wider fenders, functional skirts and spoilers. Visually, it looks like a Mustang, but in concept car form. Massive 21″ wheels complete the exterior appearance. It’s cohesive, hunkered down and menacing, just as a muscle car should be. Powered by Ford‘s Coyote 5.0 L V8 enhanced with a supercharger to deliver 725 hp, it sprints to 60 mph in 3.5 seconds. The cabin is appointed with stitched leather and carbon fiber trim that properly enhance the Mustang ambiance to rival the craftsmanship found in super cars. The VLF Automotive team prove what can be accomplished when car guys are in control. From the versatile and opulent Destino V8, to the magnificent Force 1 V10 and exhilarating Rocket V8, it’s apparent that VLF has created vehicles that are infused with serious performance, spot-on styling, and executed with a high level of attention to detail. VLF Automotive proves what’s possible when car guys are in the driver’s seat, and the results are extraordinary. Third Auto offers expert automotive industry consulting services for dealerships, manufacturers and media companies. With a focus on consumer trends, sales analysis and digital marketing tactics, Third Auto can provide insights and information across key areas within the automotive sector, in addition to article creation for website blog sections. ThirdAuto.com also offers exclusive Sponsored Content placement opportunities for advertisers to get in front of engaged auto shoppers and enthusiasts. Learn More.